Local handyman is based in Chesterfield and covers a 20 mile radius. I have over 13 years' experience in the building trade. We offer a full range of services ranging from small local projects and everything in between and believe in quality work for a fair price. From hanging a shelf to laying a patio, my main aim is offering a honest trustworthy service and happy customers who use me time and time again. 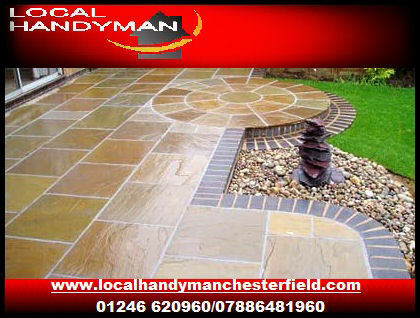 We offer a free no obligation quote, so contact me for more information. Please browse my site and look at pictures of completed work. This was the second time I have had Jon working for me and he has done a great job at a fair price and I would recommend him to everyone and will certainly have him for any further work. Asked Jon to fit some laminate flooring for me, very pleased with the result. High quality of workmanship, punctual, and house was left clean and tidy. Recommend trader, and have already used again for additional flooring job. Fair pricing. Jon did a repair for me on the corner of the roof of my house. He was very polite and did an excellent job with very little mess. He even took photos to show me what had been done. I would highly recommend Jon and wouldn't hesitate to ask for any further property maintenance required. All at a very fair price. Jon arrived on time, did an excellent job, and charged a fair price as quoted. Jon fitted a new floor for me. He is very friendly, hardworking and trustworthy and did a brilliant job. I will be contacting him for future jobs and very highly recommend him to everyone. I had met Jon a while ago as he'd put together some flat pack furniture for a family member. He was therefore the obvious choice when I needed some work doing at my home. I found him to be a very thorough, capable and organised worker. He worked through a list of outside jobs making suggestions as he went along. He is very pleasant and extremely helpful. He's a tidy worker and everywhere was clean when he left. I won't hesitate to use Jon again and will recommend him to family and friends. Thanks Jon. Cannot recommend the local handyman more, he's really friendly, trustworthy, conscientious, gave good advice and really good value for money. will definitely use him for any future jobs we have. Responded and quoted price to my e-mail the same day, and within 2 working days the work was completed. He is very thorough, and will advise the best options suitable for your needs. I would consider my request to have been a "small job", but this did not affect his approach to the work. I have asked him to quote for more work, and have confidence in his abilities. He provides a range of property services, and I would highly recommend him. Very good workmanship. My kitchen now feels complete. Would highly recommend. I moved to Chesterfield 2 months ago. The house I purchased needed some work doing so I looked at the Trusted Trader site to find a good tradesperson to ask to quote for the work. Having read the reviews about the Local Handyman I was impressed and convinced he was the right person for the job. I telephoned Jon about half past three on the 16th October 2017 to speak about the work. Bad timing on my part as he was busy at work. We agreed that he would call me later that day. He never did. Believing him to be busy I decided to email him, which I did on the 17th October and again on the 23rd October. Sadly I never, ever, received an answering email or telephone call. Very disappointing and I consequently I cannot recommend him as a reliable trader. Guttering cleaned and repaired, good job. John Handyman cleaned the gutters on my bungalow. He carried out the work in a very professional manner and I was very pleased with his advice and helpful manner. I would certainly ask for his help in the future. Jon was punctual and hard working. I would recommend him. Jon was conscientious, polite and obliging, he actually did the job for us on Bank Holiday Monday, I'd only called him on Sunday. He did a great job, will definitely be using him again. Very reasonably priced. Jon arrived punctually and worked quickly and efficiently. We found him to be a polite and helpful young man and will certainly use him again. Jon works quietly and efficiently. He got all my jobs done in a day including changing and refitting 8 fence panels. Very good value. Will use him again. Jon arrived on time, completed the job and was very professional. Cleaned up after himself and was pleased with the price as well, would recommend him to others. He was a very nice man, explained everything, pleasant, clean and tidy worker, would use him again. Jon did an excellent job of repointing 30 metres of stone garden walling at a fair price. He was prompt, professional and friendly. He did one wall first and because he did such a good job we decided to have a second wall done. The Trusted Trader was a very pleasant man, he fitted me 3 doors, I was very pleased with the job he did, he never made any mess, left my property very tidy, I would recommend him to anybody. Thank you John.